Há dias, em conversa com a Lu sobre isto de ser vegetariano, falámos acerca das possibilidades infinitas que a cozinha vegetariana proporciona. 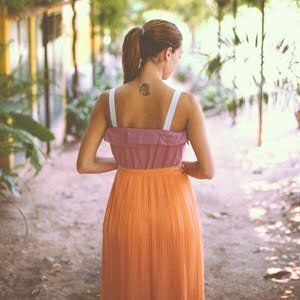 Como ela é variada, saborosa e também propensa para acrescentar alguns números na balança! 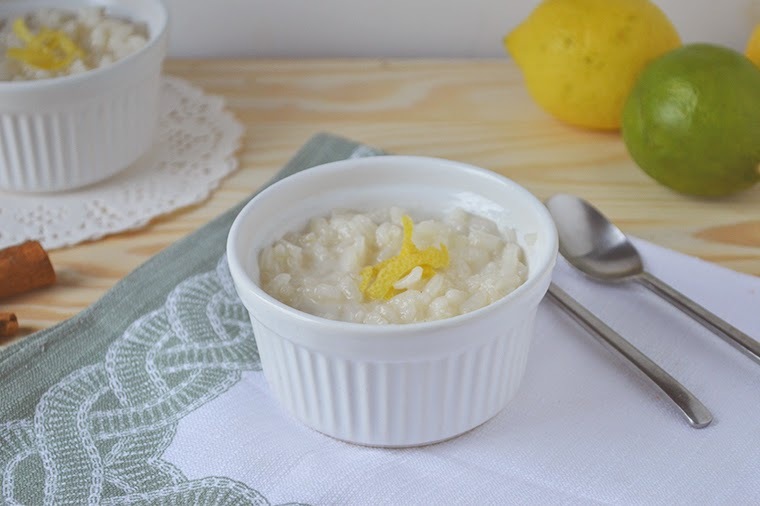 Nessa mesma conversa, entre outros pratos falámos de várias receitas de risoto e daí surgiu esta ideia de experimentar um arroz doce vegetariano ou um neste caso, um risotto doce vegetariano. Para isso usei dois ingredientes base: o leite de arroz e o arroz carnaroli. Não usei ovos e por isso ficou branquinho. 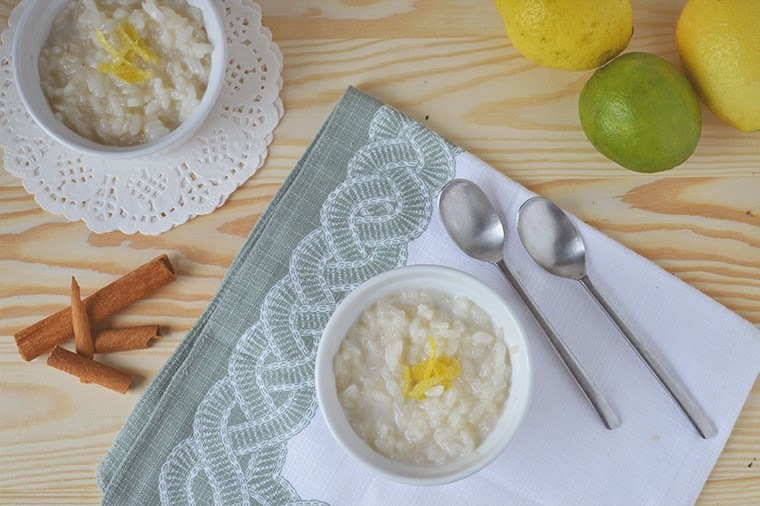 Esta parte não é novidade porque, assim como o arroz doce mais amarelo (com ovos), também o arroz doce branco é típico da gastronomia portuguesa, em alguns pontos do país. Gosto de inventar e experimentar coisas novas na cozinha. É verdade que nem sempre calham bem, mas esta experiencia correu muito bem e foi bem aceite pelo júri cá de casa! 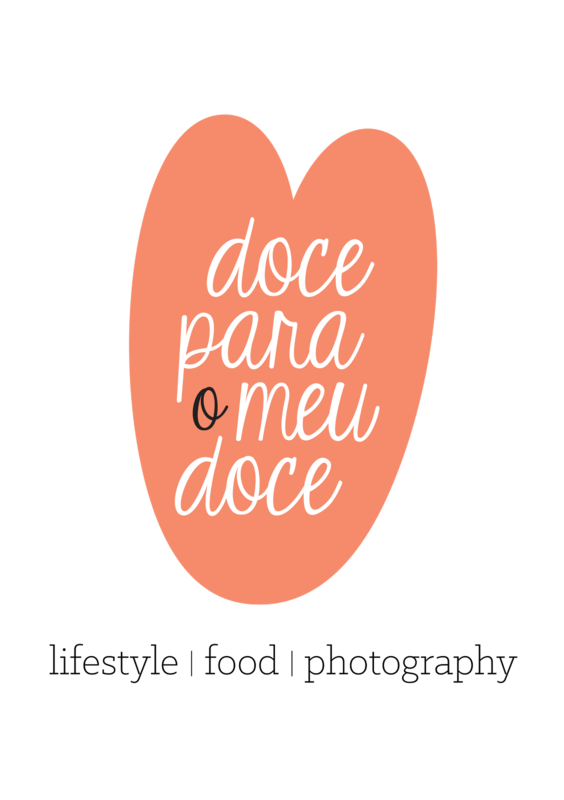 Para guardar no livro de receitas e repetir mais vezes, com certeza! Convém acentuar que o leite de arroz tem uma consistência aguada e que será importante ter uma alternativa para engrossar o creme, como podem ver abaixo na receita. Diga-se que por aqui não somos vegetarianos. Mas não negamos um prato vegetariano bem confecionado assim como não negamos uma boa francesinha quando vamos ao Porto!! Mas apreciamos algumas alternativas ao normal e variar o cardápio nunca fez mal a ninguém. A few days ago, in conversation with Lu about it being vegetarian, we talked about the infinite possibilities that vegetarian cuisine provides. How it is varied, tasty and also prone to add some numbers on the scale! In that same conversation, we talked among other dishes of various risotto recipes and from that I came with the idea to try a vegetarian sweet rice or in this case a vegetarian sweet risotto. 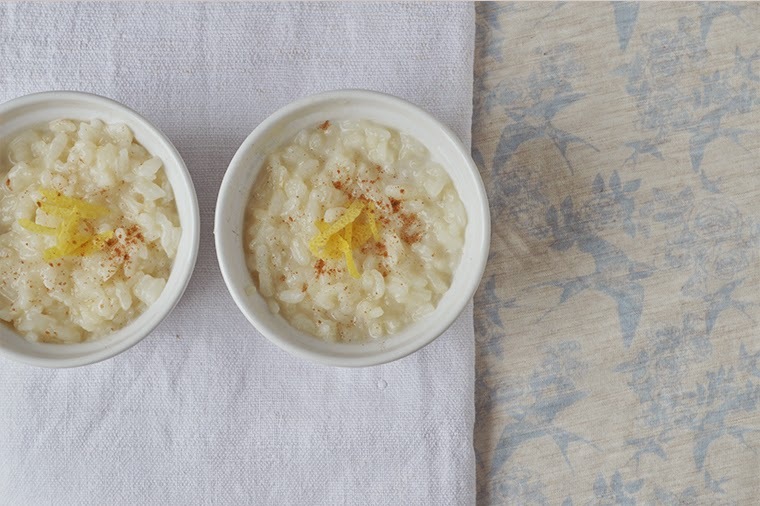 For this I used two main ingredients: rice milk and carnaroli rice. I did not use eggs and that’s why it’s white. 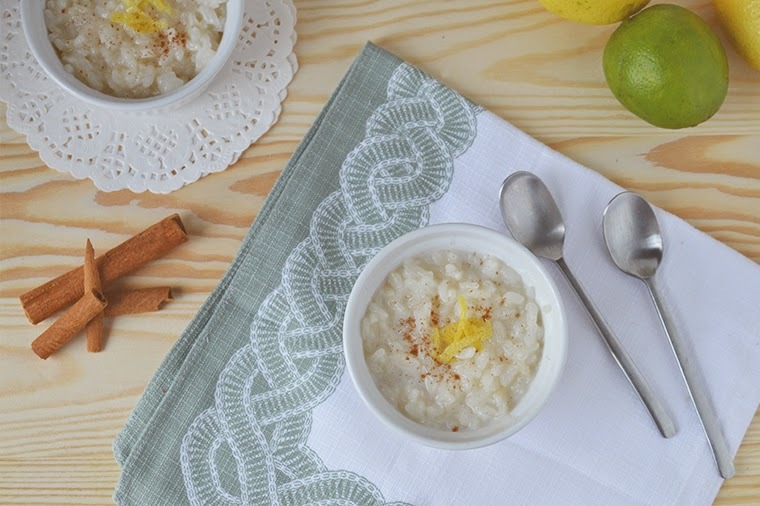 This is not new in Portuguese cuisine because, like the yellow sweet rice (with eggs), sweet white rice this is also a typical dessert of Portuguese cuisine in some parts of our country. I like to create and try new things in the kitchen. It is true that sometimes I don’t get it right, but this experience went very well and was well accepted by the main jury! It’s a keeper, going straight to the recipe book and repeat other times, for sure! It’s important to mention that rice milk has a watery consistency and it will be important to have a thickening agent, as you can see below in the recipe. We are not vegetarians, around here. But do not deny a well-made vegetarian dish as we do not deny a good francesinha when we go to OPorto!! We enjoy some alternatives to everyday cuisine and some variety in the menu never hurts anyone. Bake the rice in boiling water and season with a pinch of salt. Meanwhile boil the milk along with lemon peel, cinnamon stick and sugar. When the rice is almost cooked and the water almost evaporated, add the vegetable cream. Stir well and add little by little the boiled milk to the mixture of rice, stirring constantly. You should not add the sugar before the rice is cooked, because it makes stop baking. As the rice milk is more watery than cow milk, to thicken my trick was to ad one teaspoon of corn starch, to the prepared rice. First dissolve the corn starch in a little of that boiled milk. As it evaporates the milk begins to create a cream around the pot and the rice starts to get a creamy consistency. Once you have the desired consistency, given that incorporates more after cold, turn off the heat and place in bowls removing the cinnamon stick and lemon peel. Garnish with cinnamon to taste. Is also great cold with fresh fruit: strawberries or mango.